As previously reported, increasingly rich dead dude Michael Jackson has an album of unreleased tracks on the way. The record was said to be coming this month, but now has a December release date and has been given the straightforward title Michael. According to a press release, "fans will get mind-blowing insight into how this artist worked and a chance to hear the songs he most recently created, along with tracks that Michael had a desire to bring to fruition." 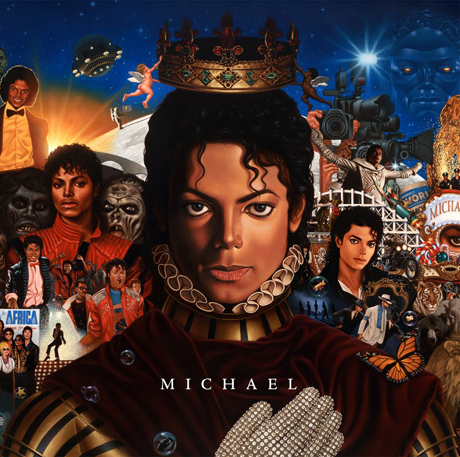 Michael's album cover (above) was painted by Kadir Nelson. A tracklisting is not available at press time, but a song from the album, "Breaking News," is set to drop on Monday (November 8) via Michael Jackson's official site. The track was recorded in New Jersey in 2007, but was only recently mixed and mastered. It will be available to stream for one week only. Michael will be available on December 14 via Epic Records.